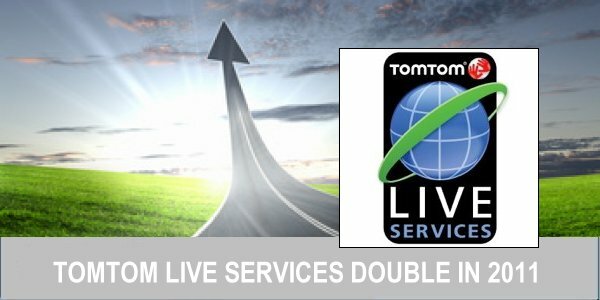 At the end of 2011, 1.5 million people around the globe will be actively using TomTom LIVE Services, including TomTom HD Traffic. The latest figures from TomTom show that they have increased the number of users by 810,000 this year, up from 690,000 at the start of the year. HD Traffic is the TomTom service that delivers real-time traffic information to their LIVE connected range of devices. Utilising data from other LIVE devices as well as Vodafone network customers, the system can pinpoint traffic issues and offer drivers routes that will avoid them. Over 80 million people share anonymous location data with TomTom. Currently, over 90% of TomTom's automotive systems and 20% of TomTom's Portable Navigation Devices sold in Europe come equipped with LIVE Services. The UK has the highest take up and renewal rate of HD Traffic within all TomTom's markets, significantly higher than the rest of Europe. TomTom HD Traffic now claims to provides highly accurate traffic information of the whole road network including exit roads, slip roads and minor roads, which are not covered by competing technologies. As long as you don't live in Scotland or Wales??? I think credit where credit is due. Their traffic flow data I've found to be excellent. I have however more recently found more and more of what can only be described as ghosts delays. HD Traffic reporting delays and then I've seen nothing but clear roads ahead. Better this way than the other way around I guess. Just a pitty they can't get it so right as to tell me when major roads are closed though. These figures are relatively meaningless. TomTom might just as well have said we have sold x million devices this year. The important figure is the number of subscription renewals, which is a figure never mentioned. Two of the largest ever topics on the TT Discussions Forum are about the rubbish range of the HD Traffic service - TT keep trying to close it down or ignore it, but it rears its ugly head again. You (well, TomTom) certainly CAN fool most of the people, most of the time. Same old marketing hype like MapShare being used by millions of users and millions of miles of roads changing every year. I have just been in contact with TomTom who have informed me that in the UK they are seeing an 'average of 28% renewal rate'. This is a very respectable renewal percentage and this figure is far more important to both TomTom and the user base as it is more indicative of the real churn rate after the initial free or bundled Live services have expired. I have just been in contact with TomTom who have informed me that in the UK they are seeing an 'average of 28% renewal rate'. So less than 28% of people who buy connected devices continue with their subscription after the trial/purchase bundle? I'd have thought that was a very low figure. So less than 30% of their customers think the Live services are of enough value to continue the subscription? 28% is actually a very high percentage. The normal retention rate for subscriptions is between 2% and 10%. That make the TomTom Live a very good return. I think to be fair, the majority of non-renewals is likely to be those who have no idea how to go about it - isn't it a well known urban myth that a very large number of TT buyers never update maps or OS? Sure, I haven't renewed Live services on one of my devices - partly because I still have it on another device, but also because I'm dissatisfied with the service, and I won't be renewing on the remaining device if they don't get the range back to a useful distance. Our PND market share in Europe was 45%, which is the same as in the prior quarter. Our North American market share grew sequentially from 21% to 25%. Consumer announced the introduction of the VIA range of PNDs for the nascent Indian market. The VIA range was also introduced in Mexico and Argentina. A new GO LIVE range was launched with travel-specific apps which include Expedia, TripAdvisor and Twitter. The take up rate of our LIVE Services increased in the quarter to 28% compared to 21% last year. Our latest map release covers 35 million kilometres of navigable roads in over 100 countries. Licensing announced a number of traffic information related contracts, amongst others with the Flemish government and Mappy. As a group we showed our commitment to reducing congestion by launching our Traffic Foundation which is dedicated to fostering collaboration and nurturing talent in the field of traffic management. TomTom Places was launched on the iPhone and made available in 5 countries in Europe. Automotive announced the expansion of existing relationships with Renault, Fiat and Mazda. We will be supplying Renault�s electric vehicle Fluence with our factory fitted navigation product, including a real time charging station reservation feature. We will supply the new Mazda 3 and CRX-5 series with our solutions, of which the latter will be factory fitted. Fiat has announced that it will offer our integrated solution as an option on the new Panda. All solutions are connected and offer LIVE Services, including HD Traffic. Business Solutions expanded geographically into Australia. In the quarter, the number of WEBFLEET subscriptions grew by 9,000 to 161,000, a year over year increase of 39,000 or 32%. With over 13,000 individual customers, Business Solutions now has the largest customer base of any telematics service provider in Europe. Thank you shareholder. But I fear that doesn't get my device to show me the traffic on my route, does it?